Elizabeth B. Bentley, aka Beth Budd Bentley, has done research on William Blake on five continents. She has lived with William Blake for 47 years, which is better than Catherine Blake did. But she is not so proficient with a pencil or a printing press as Catherine was. Claire Colebrook teaches in the Centre for Comparative Literature and Cultural Studies at Monash University. She is the author of New Literary Histories (1997) and Ethics and Representation (1999). She is also the co-editor of Deleuze and Feminist Theory (1999). Angela Esterhammer is Associate Professor of English and Comparative Literature at the University of Western Ontario. She is the author of Creating States: Studies in the Performative Language of John Milton and William Blake. The Romantic Performative is forthcoming from Stanford University Press. 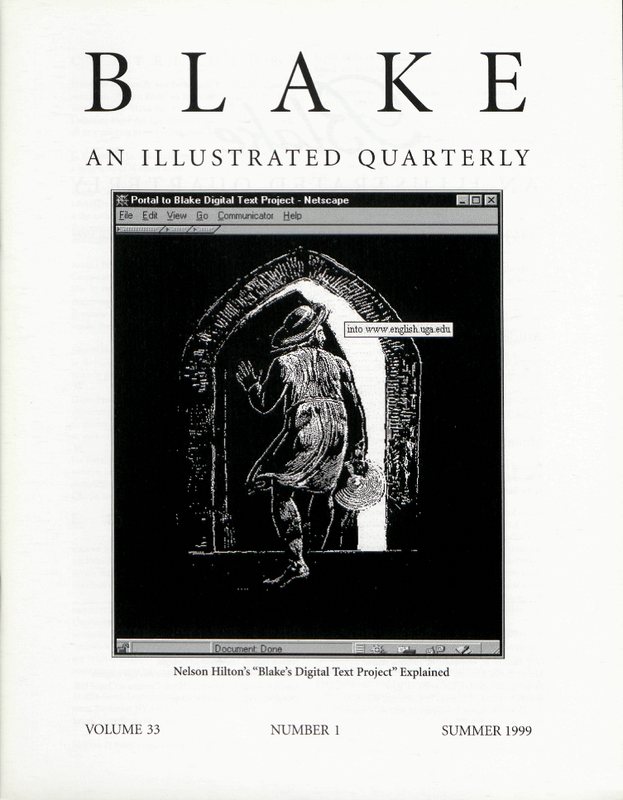 Nelson Hilton’s “Hymns and Blake’s Songs” appears in Blake in the Nineties, edited by Steve Clark and David Worrall and recently published by St. Martin’s Press. David Perkins is Marquand Professor, Emeritus at Harvard University. He has published books and articles on romantic poetry, modern poetry, and other topics. He is currently at work on a book on Romanticism and Animal Rights. Joe Riehl is Professor of English at the University of Southwestern Louisiana. He is at work, with Edwin Marrs, Jr., completing the remaining three volumes of The Letters of Charles and Mary Anne Lamb. MANUSCRIPTS are welcome. Send two copies, typed and documented according to forms suggested in The MLA Style Manual, to either of the editors: Morris Eaves, Dept. of English, University of Rochester, Rochester, NY 14627; Morton D. Paley, Dept. of English, University of California, Berkeley, CA 94720-1030. Electronic submissions are encouraged. You may send a diskette, or you may send your article as an attachment to an email message. The optimal format is Microsoft Word. Other formats are usually acceptable.